Crop & Resize Video Freely? Denoise, stabilize, rotate, trim, merge, compress, add effects, etc. in 1 click! When you record a video, there may be some parts in the shot that you don't want to keep, like the unkown strangers, unnecessary surroundings or black strips. When you upload a recorded video to online sites like YouTube, you may need to crop some parts from the video to fit the required aspect ratio... Whenever cropping is inevitable, you may want to crop video on Mac while keeping the video image intact without changing the aspect ratio, or crop videos to a different aspect ratio to gain a different composition of the video image. Anyway, how to crop a video on Mac to get a desirable video? The video cropper Mac is exactly what you need. To crop video on Mac freely without getting any distorted outputs, the video cropper for mac MacX Video Converter Pro (now renamed VideoProc) is your best bet. 1. Crop any videos, 4K camcorder AVCHD, HD video shots, SD videos, crop YouTube videos Mac, crop mp4 video on Mac, any other formats. 2. Crop videos on macOS to 16:9, 4:3, 1:1, auto crop the letterbox, or keep your desired area for full screen TVs, mobiles, other displays. 3. Crop videos with the same video size, or freely change the video size to 720x576, 704x576, 720x480, 640x480, 480x320, etc. 4. Freely select your favorite scene and remove unwanted parts by entering the specific position or drag the area with mouse. 5. Convert the cropped videos on Mac to MP4, H.264, H.265, HEVC, MOV, 3GP, AVI, FLV etc to upload to YouTube, Vimeo, FB, play on iPhone, iPad, Android devices, share with friends via email etc. 6. By cropping videos, the output file size will be 30%- 40% smaller without any quality loss at all. First of all, free download the video cropper Mac on computer. It supports macOS Mojave, High Sierra, Sierra, El Capitan and earlier. Then let's see how to crop videos on MacBook Pro, Air or mini. Step 1: Now launch the video cropper and you will see the interface like the image above. To resize a video, click Video to enter into the video process page. Then click Add Video button on ther top bar to load the video, or you canadd it by drag and drop. 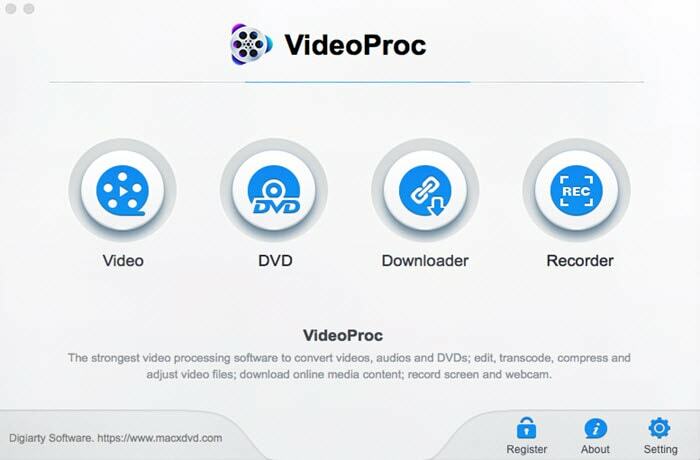 The program can crop MP4 video on Mac, AVI, MOV, MKV, FLV, MTS, AVCHD, QuickTime, iMovie, and any other formats. Plus, it also let you to crop videos from YouTube, Vimeo, FaceBook or other sites. Step 2: Then click the Crop icon on the bar below the video info. To resize the video on Mac computers, click "Crop & Expand" and check "Enable Crop" and start cropping videos on macOS. Step 3: There are built-in crop presets, with which it will automatically crop the letterbox to automatically remove the black bars off of a recording, keep original aspect ratio, or crop video Mac from 4:3 or 16:9, 1:1 etc to fit different displays. Step 4: You can also select the area to keep by resizing the rectangular box on the screen with your mouse. Check the Expand Setting to auto keep the original resolution. Then click Done and the video cropper Mac will bring you back to the main interface. Step 5: Export the cropped video to desirable formats. This depends on how you want to use with the output video. Whether you want to play the video on iPhone, iPad, Samsung, Huawei, other mobiles, upload to social sites, save in cloud services, or stream to media servers, you can find a preset here. If you don't want to bother, MP4 is recommended. Then click Run. As a video editor for Mac, MacX Video Converter Pro features a range of advanced editing features besides video cropping. 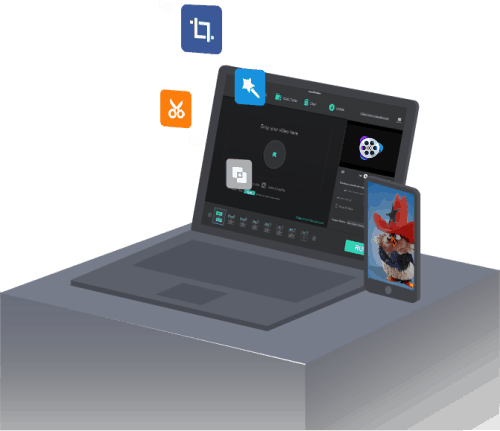 You can trim and split video length, add subtitles to movies, add personal watermarks, merge multiple recordings into one, compress video size, record computer screens and more. MacX Video Converter Pro is an easy video cropper for Mac to crop MP4, MOV, AVI, 3GP, H.265, MKV, YouTube etc without quality loss. 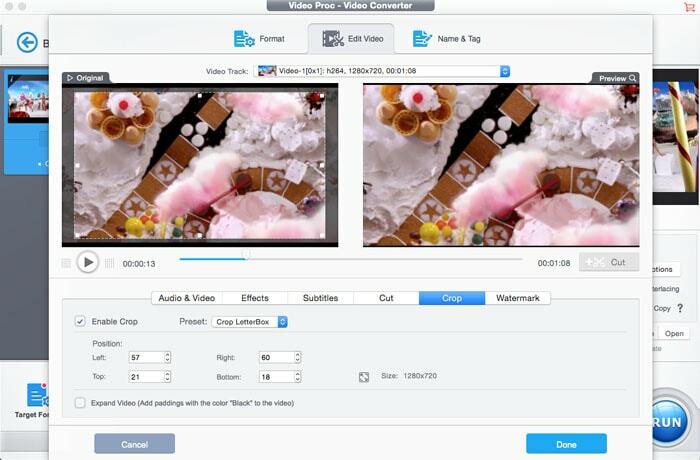 It's also an overall video editor to trim & split videos, add watermarks & subtitles, compress videos, and do more.